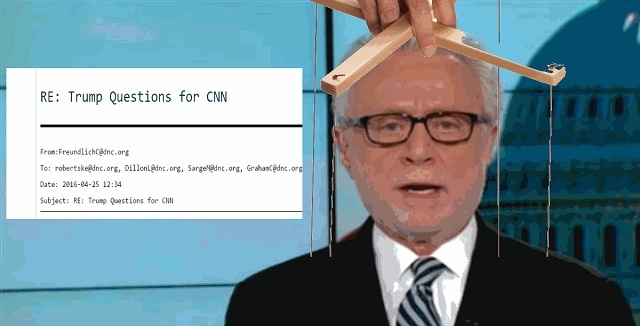 Leaked emails show CNN colluded in secret with the Democratic National Committee to get "gotcha"-type questions for interviews with Donald Trump! CNN asked the Democratic National Committee for questions to ask during interviews with Donald Trump and Ted Cruz earlier this year, emails released by WikiLeaks on Sunday show. CNN's Wolf Blitzer partying it up at the DNC. Several days before that, Dillon asked for questions for an interview that Trump was scheduled to have with CNN’s Wolf Blitzer. The group of DNC staffers submitted numerous questions for Blitzer to ask of the real estate billionaire. But the interview ended up being cancelled, Dillon informed the DNC staff in a follow-up email. The media is nothing more than a propaganda arm of our criminal elites! This is total proof the lying media is colluding with the Democrats to prevent our revolution! We need every good American to get out to the polls and bring all their family and friends to defeat this crooked system and elect Donald Trump!